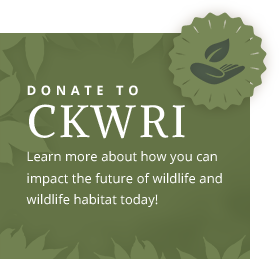 Our research program focuses on the ecology, conservation, and management of waterfowl and wetland birds with particular interest in developing solutions to applied problems at an array of spatial scales. Dr. Ballard and his students investigate ecologically relevant questions dealing with energy use and nutrition during migration and winter, habitat use, spatial and temporal changes in habitat/resource availability, migration ecology, and vital rates such as survival and reproductive success, and the program has strong working relationships with federal and state agencies, and NGOs. 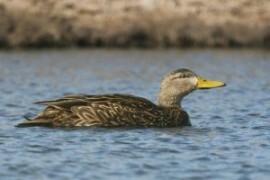 Recent research involves investigating the nutritional ecology of wintering northern pintails, assessing the impacts of recent wind energy developments on wintering redheads, developing a decision support tool for mottled duck conservation in the western Gulf Coast, studying the movement ecology of mid-continent greater white-fronted geese, understanding the migration ecology of the reddish egret, and investigating the migratory connectivity between populations of the red knot. Waterfowl are the backbone of our research program as the Texas Coast is the most important wintering area for waterfowl in the Central Flyway. The vast coastal marshes, lagoons, and inland agricultural areas have been the grounds for much of our research. Large numbers of northern pintails, redheads, and greater white-fronted geese rely on the Texas Coast during the nonbreeding period and have been a focus of much of our research. Not only do we investigate a myriad of questions concerning migrating and wintering waterfowl, we also have species that breed along the Texas Coast such as the mottled duck and black-bellied whistling duck. These species also are an important focus of our research program. 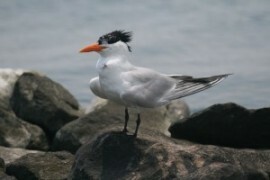 Over 26 species of waterbirds breed along the Texas Coast on natural and man-made islands in the bays and estuaries, and along rivers and isolated wetlands inland. 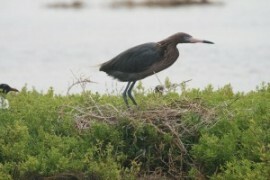 We have been conducting long-term research on the reddish egret which is North America’s rarest and least studied heron. Our research has included estimating survival of hatch-year and adult cohorts, assessing population structuring, modeling the spatial and temporal availability of foraging habitat, and investigating several aspects of movement ecology. Shorebirds are a group of waterbirds that use a myriad of wetland habitats along the Texas Coast during migration and winter. Many shorebird species nest in the high arctic and make some of the most impressive migrations among birds, traveling across multiple continents and traversing thousands of miles between nesting and wintering areas. Very little monitoring occurs for shorebirds, and as a result their distributions and abundances during certain parts of the annual cycle are relatively unknown. Our research goals are to be proactive and instrumental in guiding management plans to reduce potential negative impacts of impending development on important migratory stopover habitat for these charismatic species.